Various jurisdictions developed public education programs to address emergency readiness with key constituencies in their city, including programs that specifically target vulnerable populations (including the disabled, elderly, and non-English speaking populations). The Santa Barbara County Operational Area has incorporated the best practices of each of these programs and adopted Aware & Prepare as the name for its public education and awareness program. This effort kicked off with a series of Public Service announcements on radio and television. Only 1 in 10 American households have taken the appropriate preparedness steps: a family emergency plan, an emergency supply kit, and training in First Aid and CPR. This is due to a variety of factors including denial, the absence of a sense of urgency, the lack of consistent and accurate information, and the limited availability of culturally-appropriate resources translated into multiple languages. Public education and awareness is often the most important mechanism by which communities can strengthen resilience, and, as a result, minimize the impact of emergencies and disasters. The more prepared residents are to survive on their own, the more government agencies can focus their attention and resources on incident response — on saving lives and rebuilding critical infrastructure. Unfortunately, public education programs are often the first to be cut when fire and law enforcement agencies confront budgetary restrictions and staff shortages. For this reason, the Aware & Prepare Initiative prioritized public education and awareness above all other emergency management capabilities for philanthropic investment. This included funding support for Community Emergency Response Teams (CERT) and Listos. The CERT program educates people about disaster preparedness for hazards that may impact their area and trains them in basic disaster response skills, such as fire safety, light search and rescue, team organization, and disaster medical operations. Using the training, CERT members can assist others in their neighborhood or workplace following an event, when professional responders are not immediately available to help. CERT members are also encouraged to support emergency response agencies by taking a more active role in emergency preparedness projects in their community. The Listos program was developed to address the gap in emergency preparedness education and training for Latino populations. Listos partners with community leaders, jurisdictions, non-profits, faith-based organizations, schools, and other community institutions to eliminate the language barrier that so often impedes the relationships between first responders and the Latino community. In doing so, Listos facilitates the building of communities and the sharing of resources that strengthens community ties through disaster preparedness education. The Listos curriculum features low-cost to no-cost preparedness initiatives and provides tips that serve participants not only during disasters, but also throughout the course of their everyday lives. The CERT program is a national program supported by the Federal Emergency Management Agency (FEMA) and includes a standard curriculum and training requirements. The eight-week course is rigorous, but approachable for different learning styles. In Santa Barbara County, the structure includes a County CERT Committee that helps coordinate all eight jurisdictional programs and facilitates an annual drill in coordination with fire and law enforcement agencies. The CERT Committee has a small annual budget that is allocated for the purchase of equipment and uniforms, and for hosting networking opportunities. The Listos curriculum continues to be refined as the program grows from Santa Barbara County to reach other communities throughout California. The Train-the-Trainer guide has also been adapted to meet the unique needs of Latino populations. Over 5,800 residents have received CERT training in Santa Barbara County (over 1% of the population). 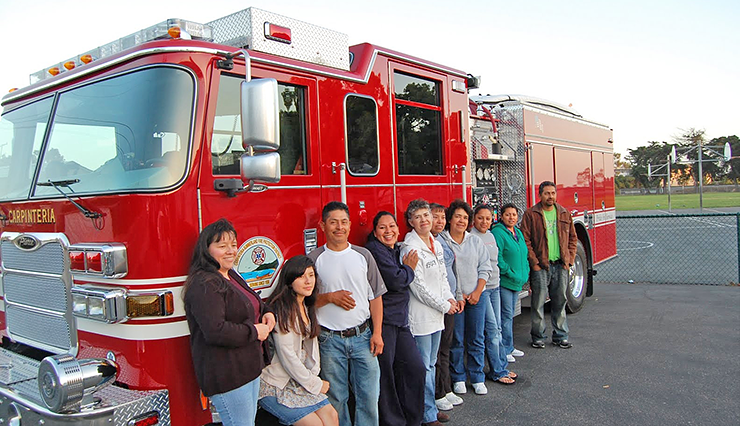 In 2012, the county began teaching CERT in Spanish and trained over 300 monolingual Spanish speakers. In the same year, the County CERT Committee received the California Governor’s Volunteering & Service Award for Service Group of the Year. In 2014, Santa Barbara County conducted the first Spanish CERT Train-the-Trainer program in the nation and certified 38 Spanish instructors. Listos has trained over 588 monolingual Spanish speakers in Santa Barbara County. This includes the certification of Promotoras de Salud to teach Listos in their own communities. Listos Train-the-Trainer programs exist in Santa Maria, Santa Barbara, and Carpinteria. In early 2014, the Listos program was also piloted in the Bay Area, Los Angeles, and San Diego. Both the CERT and Listos programs are built on models that certify trainers to continue teaching the course as needed. The Santa Barbara County CERT Committee continues to provide training and support for both on-going and new programs. In 2014, the Santa Barbara County CERT Leadership Academy was launched to provide advanced training to CERTs while also identifying local CERTs who are interested in helping take the program to the next level by creating a more team-based program model.